Today, we’re looking at a Supporter card named Lady. This is based on the Lady trainer class of the core series Pokemon games. Such a trainer class actually gives you a ton of prize money when defeated! One example would be a Lady in Route 104 with her Level 27 Linoone on the second battle and nets you 5400 (10800 with Amulet Coin). If they are extraordinarily generous with prize money, maybe the TCG version of Lady would net you lots of stuff. And indeed she did! She lets you search your deck for FOUR Basic Energy cards. One might wonder why you need so many when you can manually attach one Energy card per turn, and that’s because there are some Pokémon that lets you attach as many energies from your hand as you like. Blastoise BCR & PLB, Emboar BW & LTR, and both Lightning and Metal Magnezone BKT, ULP, FBL comes to mind. Or, you can fetch basic energies as discard fodder, only to be recovered AND accelerate energy to one of your Pokemon. Eelectrik NVI, Bronzong PHF, and Malamar FBL comes into mind. Lady has singlehandedly made Cilan NXD obsolete as she does the job better than him since he only fetches three basic energies, one less than Lady. Talk about power creep, but I don’t see her being used via four copies, but she will see play. In Limited, she is useful for getting energies and thinning your deck. Lady (FLI 109) gracefully enters the meta from the Forbidden Light expansion set. This Supporter card allows you to reach into your deck and grab four Basic energy cards. I tried this with a Dusk Mane Necrozma GX / Magnezone build and with Alolan Dugtrio. With Dusk Mane, I went 7 W 7 L. Dugtrio fared far worse with only a single win in six matches (yeah I was DEFINITELY wrong about it being the next Night March). Lady did help at times with both decks. Even with Dugtrio, there was a time that I did 240 damage thanks to Lady’s help… unfortunately it was against Solgaleo GX. The Dusk Mane Magnezone build used it a number of times as well. It might be better in the future when we get a better way to access Supporters out of the discard (there’s a Delcatty coming in Celestial Storm that has an ability – not an attack – allows you to grab two Supporters out of your discard pile when you play it from your hand). I also thought about maybe incorporating Spiritomb, that might help gain access to Lady when you need it. I decided against trying it with Greninja, however, since Fisherman is probably the better choice for that deck. Overall, this card won’t see play in all but a handful of decks, and it didn’t help catapult those decks up to Tier 1 status. Still, it’s worth keeping in the back pocket. The meta is changing in a big way after September 1st, and this strikes me as a card that could be eminently useful in the right situation at the right time. Lady (SM – Forbidden Light 109/131) is our subject today. She actually is a runner-up from the top 10 countdown we did for SM – Forbidden Light. She’s a Supporter, so she faces stiff competition in slipping into crowded deck builds, though things may open up a bit in Standard post-rotation, and Expanded is already a tad more friendly due to VS Seeker. In the Theme Format of the PTCGO, she’s proven quite handy in the “Tropical Takedown” Theme Deck, and okay in the “Twilight Rogue” Theme Deck, which means she’s also probably a must-run (though still merely “good”) for Limited Format play. Her effect allows you to add four basic Energy of any Type to your hand. This means she’s rendered Cilan and Clement obsolete. So, is she the best for getting Energy to your hand from your deck? We’ve got the Item card “Professor’s Letter”, which adds two basic Energy from your deck to hand, as well as “Energy Loto” to snag an Energy card from the top seven cards of your deck (if any are there) to your hand. Getting half the effect but only using an Item seems like a better deal unless you need it to be via a Supporter or it really needs to be three to four Energy from a single card. With most decks running at least some Special Energy, even Energy Loto might make more sense for a deck than Lady. Then we get to the less-direct competition. Fisherman lets you add four basic Energy cards from your discard pile to your hand; weak early game, but likely to become better and better as your deck runs low on Energy but your discard sees more and more. Good draw power also grants the potential to add Energy to your hand; it is down to luck of the draw but adding a little more draw power to your deck is likely to help in all other areas, so it still acts as competition to Lady. 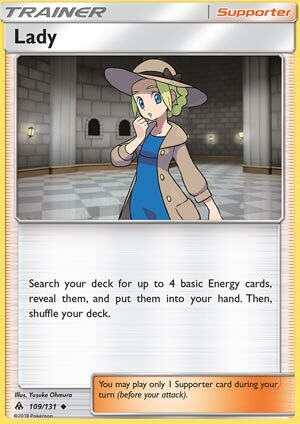 Cards that return Energy from your discard pile to your deck even provide another form of indirect competition; some work with Pokémon as well, others are Items that return a decent amount of Energy to the deck, and both combo with Lady herself as well (as general draw) for adding Energy from deck to your hand. She does have a niche, however! I’m not sure any current, top competitive decks will need her, but if a deck needs several basic Energy in the hand, then she really does edge out (or may even be run alongside) her competition. Such decks most likely are capable of attaching multiple extra Basic Energy from hand in a single turn or need to discard multiple cards (even specifically basic Energy cards) from hand to fuel another effect. I’ve had high hopes for several such decks over the past several months (if not years), but almost all have fallen far short of being successful competitive decks, but they have worked before, so there is still a place for Lady. Lady didn’t make my own Top 10 (or 15 or 25) list, but she showed up on two others, earning a total of 26 voting points; five less than last Friday’s Alolan Marowak but three more than tomorrow’s Card of the Day. If we’d started high enough, that means Lady would have been our 18th place pick. So, since she wasn’t on my list, do I object to that? Nope; given how several of my picks have accomplished nothing, an unspectacular but solid card deserved that spot more. If you’ll indulge me, I’ll give you an idea of what Lady needed to do in order to fit in with the current, highly competitive crowd. Hypothetical number one is she needed to let you search your deck or your discard pile (maybe even both at the same time) for up to a total of four basic Energy cards (rendering Fisherman obsolete). Hypothetical number two would be her giving the player a choice between her actual effect or searching your deck for a single Special Energy card to add to your hand. I’d talk about how Supporters always seem to be the same, but I figured that would get repetitive. Which is true, it’s very hard to comment on Supporters when most draw you cards. But what about Supporters that draw you very specific cards? Not a specific number, but a specific type of card? That being said, it’d be best to avoid running Lady in decks without a recovery option or with a card that accelerates Energy straight from the deck. It doesn’t make sense to grab Energy from the deck with Lady if you could attach it with another move. So that’s something to consider with deckbuilding. Sometimes you need a lot of different Energies, which Lady can help with for multiType decks – notably the Alolan and Ultra Beast decks. So at the very least, it’s worth a try! Arora Notealus: Sometimes it’s charming to just grab what you need. be a great boost, even if other decks opt to pass on her. Side Review: Raikou-GX – Lady actually represents a nice card to utilize against a match-up when faced off with something like Raikou-GX. The devastating effects of Thunderous Rain GX could disincentivize bringing Energy out directly to your Pokemon from your deck, hurting your chances of survival and leading to a snowball effect of devastation. That being said, it’s still 4 Energy, and the most consistent non-chancy self-damaging move he’s got only does 20 damage. But it’s nice to know that if you run Lady in your deck, you can avoid hassles like this. Next Time: We venture out into the unknown depths of the multiverse!